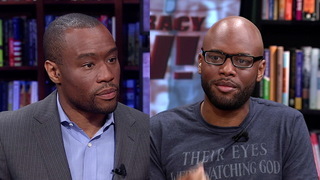 Marc Lamont Hill & Mychal Denzel Smith: We Must End State Violence Against Black Bodies | Democracy Now! contributing writer for The Nation magazine, author of Invisible Man, Got the Whole World Watching: A Young Black Man’s Education. NERMEEN SHAIKH: According to The Washington Post, 505 people have been killed by police across the United States so far this year. African Americans, especially young black men, are disproportionately the target of police violence. AMY GOODMAN: To talk more about the fatal police shootings in Baton Rouge, Louisiana, and in Falcon Heights, Minnesota, we’re joined now by two guests. Marc Lamont Hill is with us, journalist, distinguished professor of African-American studies at Morehouse College in Atlanta and author of the new book, Nobody: Casualties of America’s War on the Vulnerable, from Ferguson to Flint and Beyond. And Mychal Denzel Smith is with us, contributing writer for The Nation magazine, his new book, Invisible Man, Got the Whole World Watching: A Young Black Man’s Education. We welcome you both to Democracy Now! Marc, Let’s begin with you. I am so sorry your book is so relevant today. MARC LAMONT HILL: Yeah, that’s the disappointing, really stunning thing, is that whenever you write a book like this, it will be relevant, because state violence against black bodies is something that has consistently occurred since black people have been in America. What we’ve seen over the last 48 hours is just a re-enactment of a very, very, very common American tradition of not only killing black bodies, but also then going out and justifying the death by criminalizing the victim, by demonizing the victim, by marginalizing the victim and by constructing narratives about how and why they deserved what they got. It’s a really stunning thing, and it never stops hurting. AMY GOODMAN: How do you see that happening here in these cases, the demonization of the victim? AMY GOODMAN: Or is not known by the police. MARC LAMONT HILL: And it wasn’t known by the police. But even if it were, that doesn’t mean that you have a right to shoot someone. Selling CDs is not a capital offense. Neither is having a criminal record. And so, at that moment, the only question that should be asked is: Did the police behave appropriately? And based on what we saw in the video, they did not. But somehow we justify that certain people are worth saving, certain people are worth surviving, and other people are not. NERMEEN SHAIKH: Well, you’ve also said that in cases like Alton Sterling—and, of course, Philando Castile now, as well—that it’s often true that police officers are afraid, but it’s not of the weapon, if there is one, but of black men. MARC LAMONT HILL: Yeah, that’s part of the problem. We don’t need to always have a demon. We don’t always need a villainous cop. There are instances like in Charleston with Walter Scott, where he’s running away and he gets shot in the back. That is somewhat of an outlier. The more ordinary type of state violence that we see, that is still fueled by white supremacy, is when the officer sees a black body and is afraid, or a citizen like George Zimmerman sees a Trayvon Martin and is afraid. I don’t doubt that George Zimmerman really thought that Trayvon Martin was violent and dangerous. The problem is, there was no reason to. But what happens is, when we see someone with Skittles and a hoodie and we decide that they’re dangerous, or we see someone with their hands up and we decide that they’re dangerous, or we see someone with CDs in their hand and we decide that they’re dangerous, we simply reinforce the idea that black bodies themselves are inherently dangerous. And then, when we let them off as jurors, or as grand jurors, we ultimately normalize and codify irrational white supremacist fear of black people. NERMEEN SHAIKH: And, Mychal Denzel Smith, your book is called Invisible Man. So could you respond to these two most recent killings of African-American men and put it in the context of your book? MYCHAL DENZEL SMITH: Well, I mean, the concept of Invisible Man, Got the Whole World Watching, these people are literally invisible to us, if we want to take that in the most literal sense, before they’re shot and killed. And then we either have video or we have wall-to-wall news coverage in which they become visible to us. We have the entire world watching and dissecting their lives. And what happens is what Marc is talking about, is that the nuances and interior of their lives get dismissed. They don’t—they’re not human to us. They are avatars for a cause and, in a way, the justification of the killing and continued denigration of black—black people’s humanity. And I think that that’s the thing that we have to get to, is that we have to understand that their humanity has never been in question. The humanity of the people who’ve killed them is, the idea that you can be a humane person and take the life of an innocent person in this way. How do we shift the conversation to that? How do we shift it so that we understand that the—that these lives that are inherent with value, but we’ve designated certain people to bear the brunt of this violence, to uphold a system of inequality? AMY GOODMAN: As we are doing this broadcast now, dozens of protesters are gathering outside the governor’s house in Minneapolis, St. Paul, following the fatal shooting of African-American—of an African-American man named Philando Castile during a traffic stop for a broken taillight. In the car, his girlfriend and her daughter. The immediate aftermath of the shooting was broadcast live on Facebook by his girlfriend, Lavish Reynolds, who’s speaking in the car next to her dying boyfriend as the police officer continues to point the gun into the car. We’ve played some of this; we want to play more of this. It is so horrifying to see as she narrates her partner’s own death. POLICE OFFICER 1: Ma’am, just keep your hands where they are! LAVISH REYNOLDS: I will, sir. No worries. I will. He just shot his arm off. We got pulled over on Larpenter. POLICE OFFICER 1: I told him not to reach for it! I told him to get his hand off it! LAVISH REYNOLDS: He had—you told him to get his ID, sir, his driver’s license. Oh, my god, please, don’t tell me he’s dead. Please, don’t tell me my boyfriend just went like that. POLICE OFFICER 1: Keep your hands where they are, please. LAVISH REYNOLDS: Yes, I will, sir. I’ll keep my hands where they are. Please don’t tell me this, lord. Please, Jesus, don’t tell me that he’s gone. Please, don’t tell me that he’s gone. Please, officer, don’t tell me that you just did this to him. You shot four bullets into him, sir. He was just getting his license and registration, sir. POLICE OFFICER 2: We got a—we got a female passenger. POLICE OFFICER 1: Get the female passenger out. POLICE OFFICER 2: Ma’am, get out the car right now with your hands up. Let me see your hands. Exit now. Keep ’em up! Keep ’em up! Face away from me. LAVISH REYNOLDS: Where’s my daughter? You got my daughter? POLICE OFFICER 2: Face away from me and walk backwards. Walk backwards towards me. Keep walking. POLICE OFFICER 3: Walk backwards. POLICE OFFICER 2: Keep walking. Keep walking. Keep walking. Get on your knees. Get on your knees. LAVISH REYNOLDS: Why am I getting arrested? POLICE OFFICER 2: Ma’am, you’re just being detained right now until we get this all sorted out, OK? POLICE OFFICER 2: Looking through your purse here. POLICE OFFICER 2: Any weapons or anything? LAVISH REYNOLDS: No. Please don’t tell me my boyfriend is—no, here, take it off my head. Please don’t tell me he’s gone. Please, Jesus, no! Please, no! AMY GOODMAN: That was Lavish Reynolds. She was 24—she is 24 years old. While her phone was taken, she broadcast this live on Facebook. And that’s where the video comes from. As she was told by police to walk backwards, they handcuffed her. She is begging to see that her daughter, who’s four years old, is being taking care of, who was in the car where her partner was killed by a police officer. Mychal Denzel Smith, your response to this? And also, in your writing of Invisible Man, Got the Whole World Watching, you say you didn’t prepared for being 25, because you didn’t think you would make it. MYCHAL DENZEL SMITH: Yeah, and I think that, you know, what’s—to me, what’s so disturbing about that particular situation is that so often what we hear is, if you listen to the police, if you follow their directives, then everything will be fine. Well, here’s a man who’s actually doing that. He’s told to get his ID and his registration. He’s doing that. But the perception of him as a threat, the perception of his blackness as inherently violent, means that even if—even when he’s following directions, there’s the perception that he is going to reach for a gun, he’s going to be—react violently toward this police officer. And I think that the idea then that there’s something that can save us, that’s the problem. There’s nothing that is going to prevent this from happening to us, aside from a shift in policing. AMY GOODMAN: In fact, Marc Lamont Hill, the reason the police officer knew he had a gun is he told the police officer, when he said he wanted his license, that he had a gun. MARC LAMONT HILL: License to carry, which is exactly what you’re supposed to do. When you look at the data, when you talk anecdotally to police officers—and I’ve done both—people who have licenses to carry very rarely use that weapon in the service of a crime, a violent crime, and certainly not a police shootout. So, there’s no sort of inherent sort of inclination, you would think, to think that this man was going to engage in a shootout. He also told the officer, “I’m going to reach for my license.” According to the witness, that’s what the officer told him to do. We have no reason to think otherwise. This man has no violent criminal history. All accounts say that he was a good guy. Not that you have to be a good guy—not that you have to be a good guy to not get murdered. AMY GOODMAN: He oversaw the cafeteria at the local Montessori school. MARC LAMONT HILL: Right. And again, it goes to Mychal’s point, right? If you have a criminal profile, they say, “Well, he was a bad guy.” If you have a good—if you’re a, quote-unquote, “good guy,” it still doesn’t matter. If you—if you stand still like Eric Garner, you get killed. If you run like Freddie Gray, you get killed. If your pants are down like Trayvon, you die. If your pants are up like Walter Scott, you die. It doesn’t matter. Ultimately, the problem isn’t the people being killed. It’s the people who were rendered invisible at first, and then when they get seen and become legible, they’re still nobody. That’s the problem. AMY GOODMAN: What has to happen? MARC LAMONT HILL: We need fundamental changes in society. Fundamentally, we have to, first of all, deal with the issue of white supremacy. This isn’t an issue of racism. This is an issue of white supremacy. We live in a world where we simply believe that white people’s lives are worth more and that black lives aren’t worth much. And because of that, even the most well-meaning cop looks at a black body and still may have a bias. And it’s not just white cops, it’s also black cops. There’s a study out of Stanford that says that police officers tend to look at black children as older and more guilty than they are, which means that you see that 13-year-old boy or 12-year-old Tamir Rice, and you think he’s 21, as they did, and you shoot him like he’s 21, having a real gun instead of a play gun, because that’s what happens, even though white kids do it all the time with no consequence. So we need to redress this issue of white supremacy. We also need to deal with this question of policing. We have to ask: What role do we really want police officers to have? Do we want them to be an occupying force in our community, or do we want them to have a different role? The whole idea of broken windows policing, the idea of getting an Eric Garner off the corner for selling loosie cigarettes, the idea of chasing down a guy for selling CDs when the store owners don’t care, that itself is part of a particular understanding of policing that we ultimately have to change. NERMEEN SHAIKH: Mychal, could you talk about what you think the impact of videos like this are on the perception of African-American—the African-American community and why you think language is so important when we talk about cases like this? MYCHAL DENZEL SMITH: Yeah, I mean, my first reaction to noting that this was happening on social media and knowing that there was another video with Alton Sterling was: I can’t watch another lynching. You know? And then that’s what it feels like. That’s what it feels like. That’s what it feels like we’re living through now. But even in that, even if I construct it that way, I’m not sure where the empathy comes from. I don’t know that watching these videos time and time again is engendering any empathy toward the victims. I think that what—the problem is that people get retrenched into their already preconceived notions around blackness, right? They bring their script to these videos, and they will offer a justification. And even though—even the people that would be more sympathetic, I think that what it does sometimes is reaffirm their own distance from this type of violence, right? So, what they’re witnessing is the thing that keeps happening to black people, and not a thing that’s happening to us as a community, the thing that’s happening to us as a society, not a thing that’s being done in their name. It’s just the thing that keeps happening to black people. And don’t know—I mean, I think that there’s value in us seeing it for documentation purposes. I don’t know how much it’s doing in terms of shifting people’s attitudes around the reasons that these interactions are happening. I mean, when you talk about Alton Sterling, talk about Eric Garner, these are men pushed into an informal economy on the basis of—for survival—right?—for providing for their families. And then what we do is we criminalize those activities, and we put them in contact with police every single day. And now their—and we’ve given police license to kill, license to use violence, the latitude to get off when they do. And so, what happens? What happens to them, and not even when they’re being killed, but just the fear that they walk through everyday life with? AMY GOODMAN: And the issue of arresting these police officers. You have video of people—in this case, with badges—killing someone. Arresting someone does not ultimately mean they will be found guilty, as we know in other cases. AMY GOODMAN: But why aren’t police arrested? AMY GOODMAN: But specifically in these cases—we have 10 seconds—we have video. AMY GOODMAN: The case of Eric Garner. MARC LAMONT HILL: Right, and Eric Garner, as well. The logic of white supremacy suggests that what you saw isn’t enough, that if we hadn’t beaten Rodney King for all that time, he would have run through the community. AMY GOODMAN: We’re going to do Part 2 and post it online at democracynow.org. Marc Lamont Hill, his book is Nobody: Casualties of America’s War on the Vulnerable, from Ferguson to Flint and Beyond, and Mychal Denzel Smith, Invisible Man, Got the Whole World Watching: A Young Black Man’s Education.